That looks pretty cool. Not sure whether you can just copy the css of a forum and use it wherever you like though. I like dark themes better, such as the current one, but that looks pretty good. I think it would be a hit within the light-theme lovers. (08-17-2015, 07:18 AM)Bakanyan Wrote: That looks pretty cool. 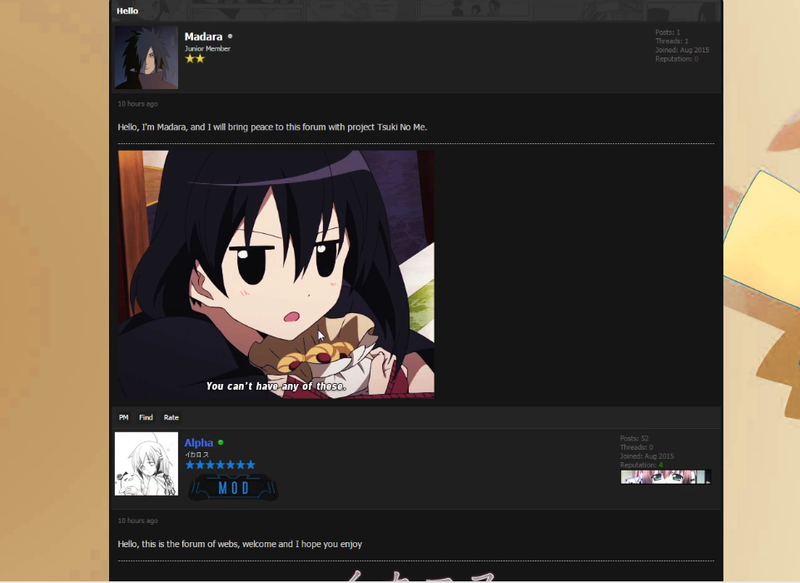 Not sure whether you can just copy the css of a forum and use it wherever you like though. 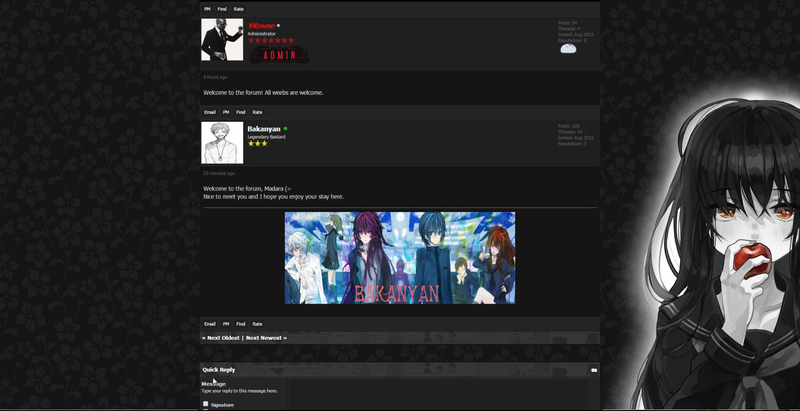 yea its not the css of another forum but a theme someone built and i have been just transferring it over to this forum so it can be used here i was also thinking of using a dark* theme but wasn't sure what colors to use any recomendations? If you look at the image, you'll find out that black, blue, and white don't go along that well. You should get a few more opinions though. I might be the only one. The dark blue (the same color as Moderators name) could look great. 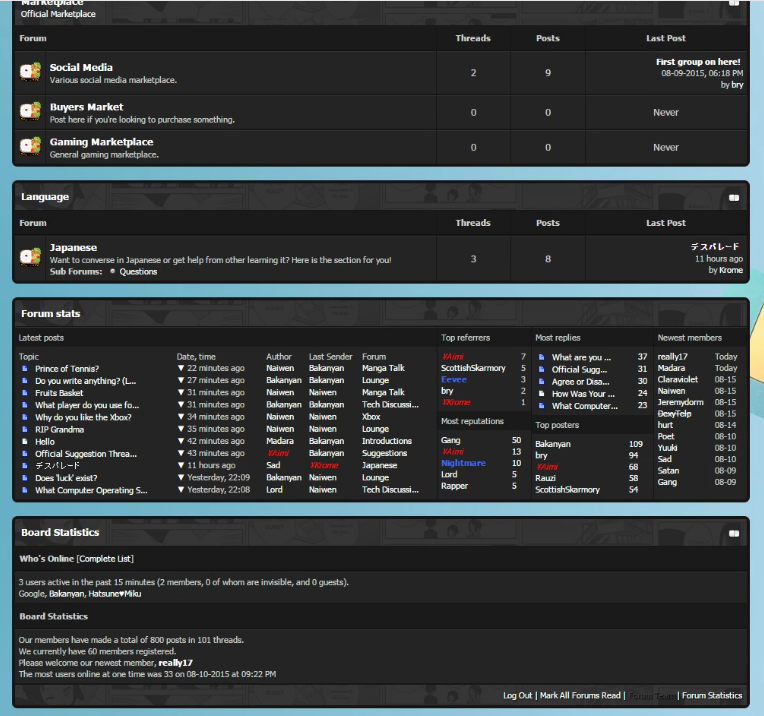 The color scheme improves with that image, yeah. Though don't you think that the girl gives a really dull impression? Aren't we supposed to have 'fun' here, lol. (08-17-2015, 08:04 AM)Bakanyan Wrote: The color scheme improves with that image, yeah. But as seen from the image, dark backgrounds do seem to go better than light backgrounds. Yeah, I tried searching. Most of them are meant for horror qwq. I'll let you know if I find some on Reddit or 4chan, etc. 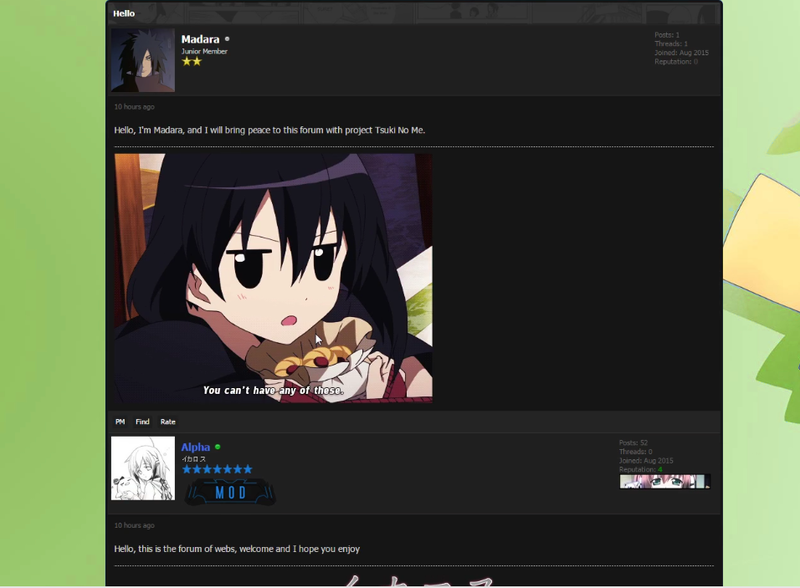 Whoa...I prefer light themes, for professional forums. Well, if you find nothing, you can just pick up a random black background then put an anime render in it. If you guys want some input..how about akatsuki colors(red and black).